The Bowne House, built by John Bowne circa 1661 or earlier, is the oldest house in Queens, an amalgam of both New World Dutch and English architectural traditions of building. It is noted for its connection to the principle of religious freedom in America. 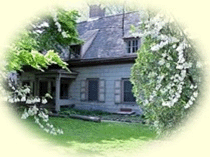 Bowne House is a city and state landmark and is listed on the National Register of Historic Places as a New York State Site of National Significance.